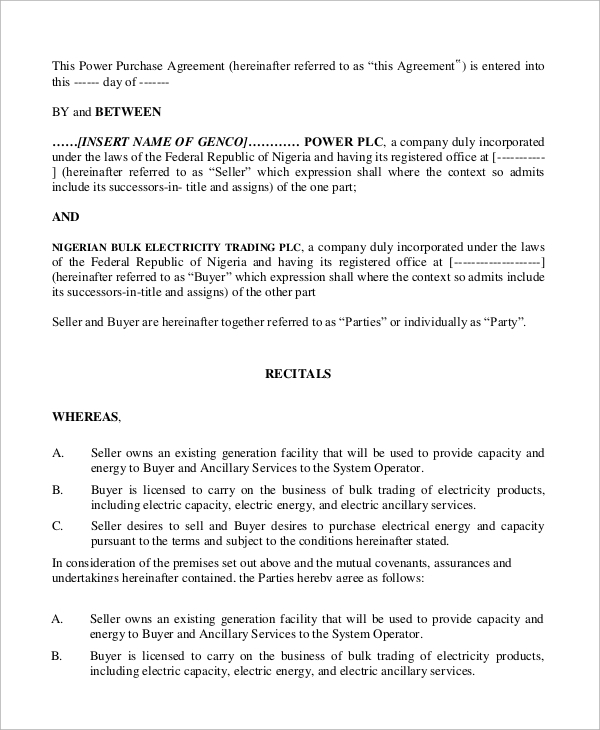 A Power Purchase Agreement is a written understanding between the power providing body and its clients. 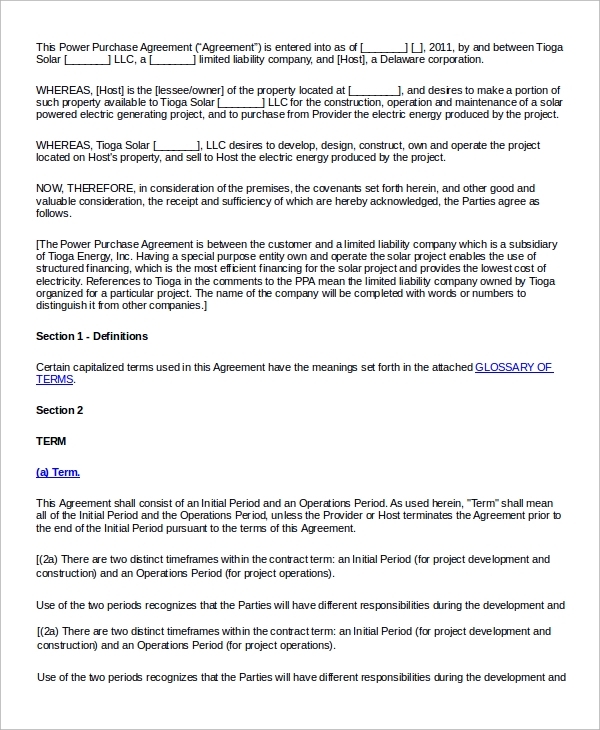 The amount of power required per month, the type of power with reference to its source and other details are included in this agreement. These make the agreements authentic and warrant that both the parties stick to certain rules. From electric power to solar power, every power supplying body needs these templates. Here are some Sample Agreements for you to check out. The first two sections contain the names and details of the seller and the consumer. It contains the terms of the Purchase Agreement, the date of termination, sketch of the supply mechanism, and other relevant aspects. This agreement consists of various terms and definitions. The quality of power supply, the seller information, scheduling and delivering aspects, and other relevant data on metering are included in the template. 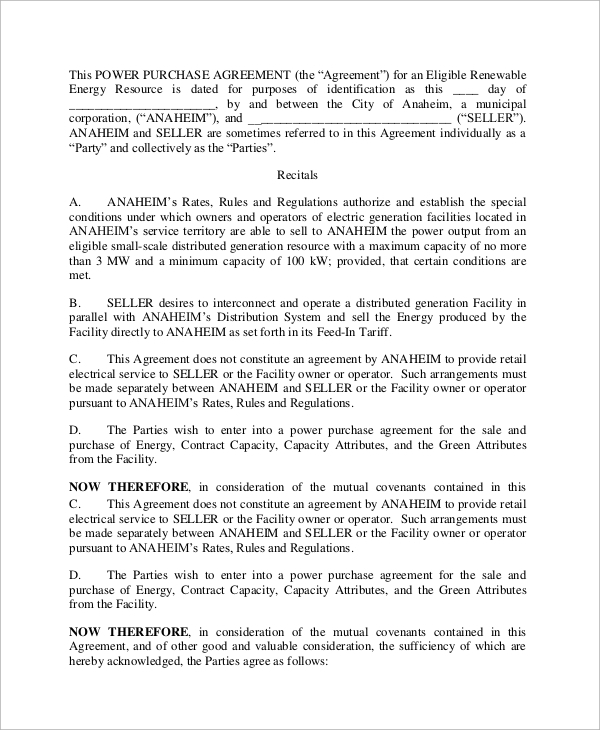 This Power Purchase Agreement Sample starts off with the name of the supplier and consumer. The definition of terms, maintenance, nomination, and other information are included in the document. Information about taxes and defaulters are also included here. What Information do these Agreements Contain? 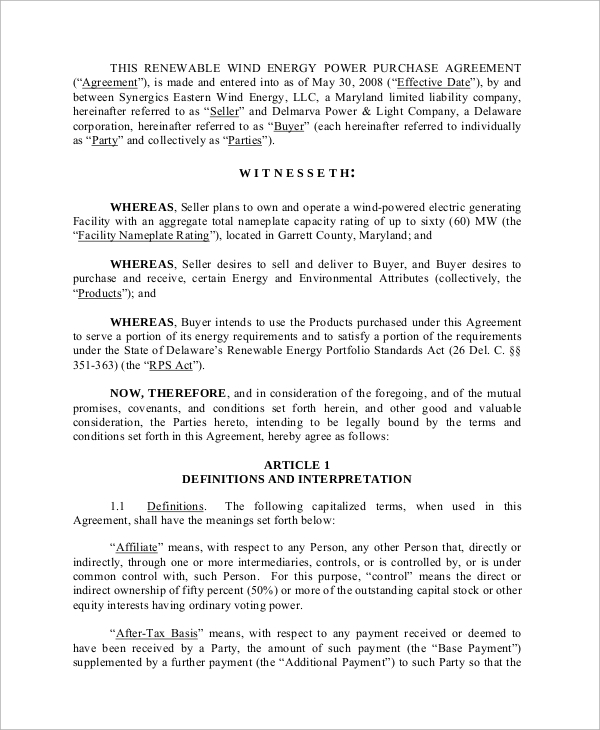 These agreements contain the complete details about the power provider and its clients. The purpose of consumption is specified here along with the span of the agreement. These are applicable for households as well as companies. The documents contain all the details of the power supply system with reference to technology. There are certain sketches showing the entire mechanism of supply. The metering requirements and engineering aspects are also mentioned in the documents. The estimated cost is presented towards the end along with other data on the company. 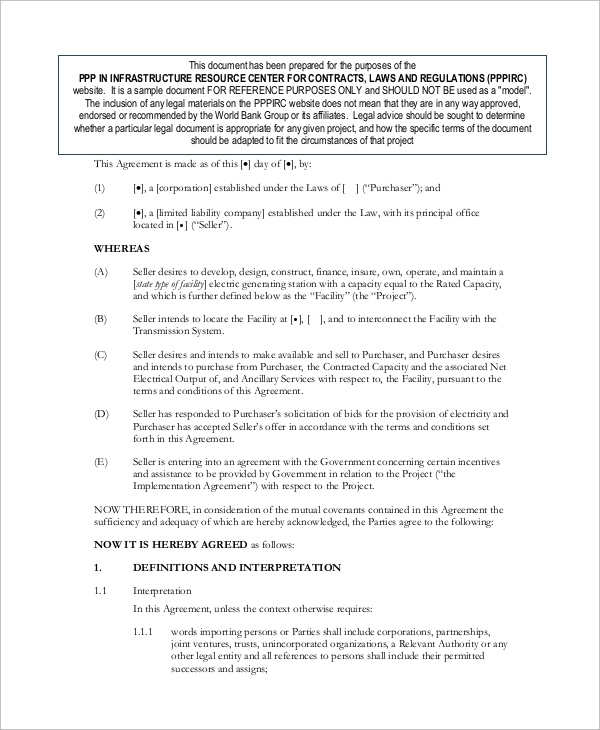 The clauses of the agreement are written after this section and are signed by the authorities. You can also see Business Partner Agreements. This agreement starts off with the names of the two concerned parties. 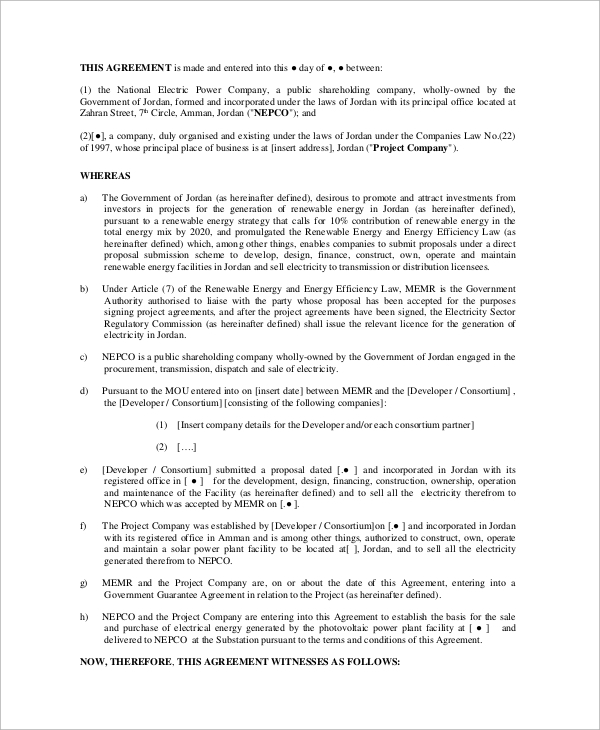 The terms of the agreement are mentioned along with numbers one after another. It includes all relevant information on tax, payment, and other aspects. 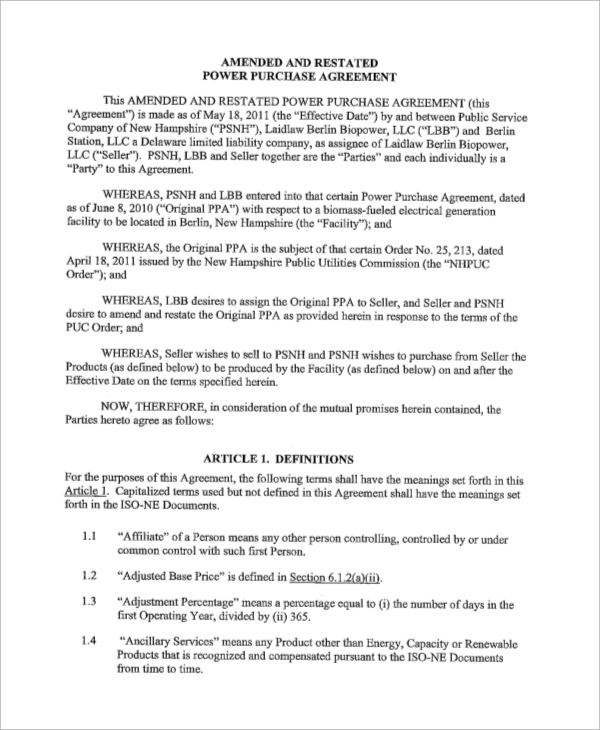 The clauses of the deal are listed in separate paragraphs, each dealing with a separate aspect. The template contains the names of the concerned parties, right at the beginning. Other information on payment defaulters, tax, and installers are also a part of the document. Why are these Agreements Important? Power is one of the most important resources of a company or household. These are important for industrial purposes too. In order to maintain an uninterrupted flow of power, you need to sign these agreements. 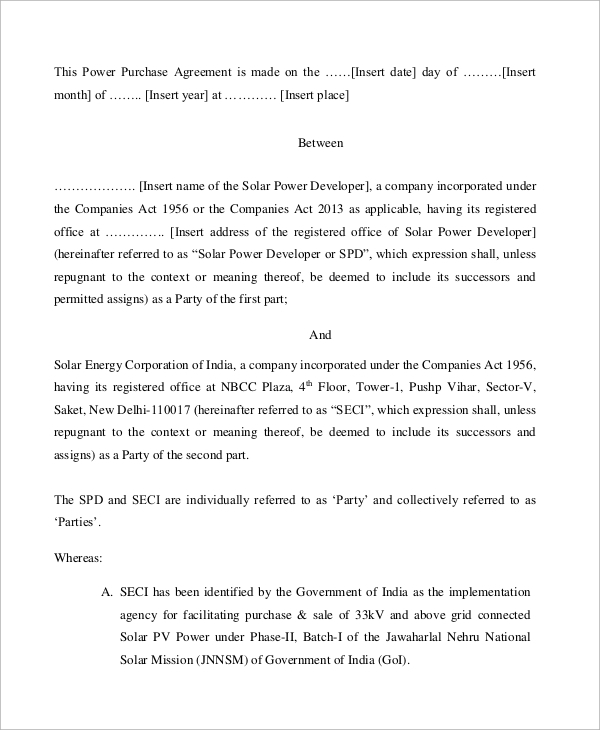 The estimated amount of power usage is mentioned in the agreement and it ensures that the deal between the supplier and its client is steady. The document is also important from the perspective of payment dates. 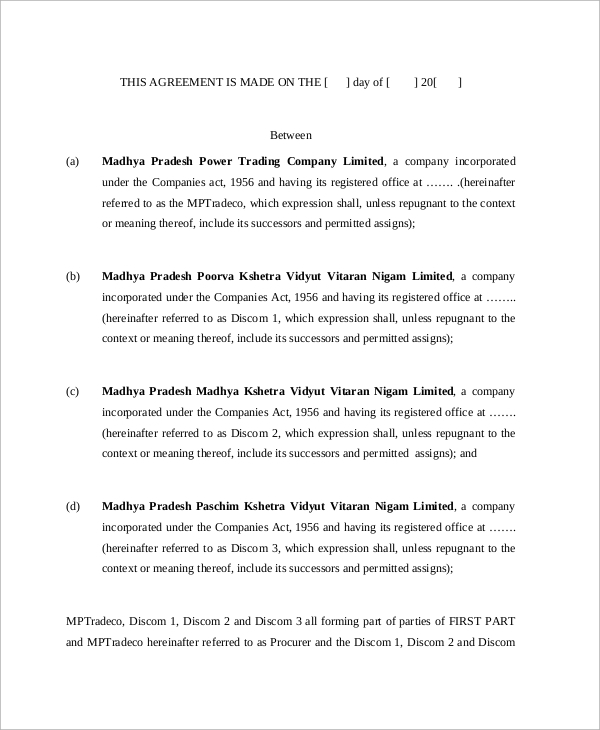 It contains the terms of the deal along with the date of termination of the agreement. 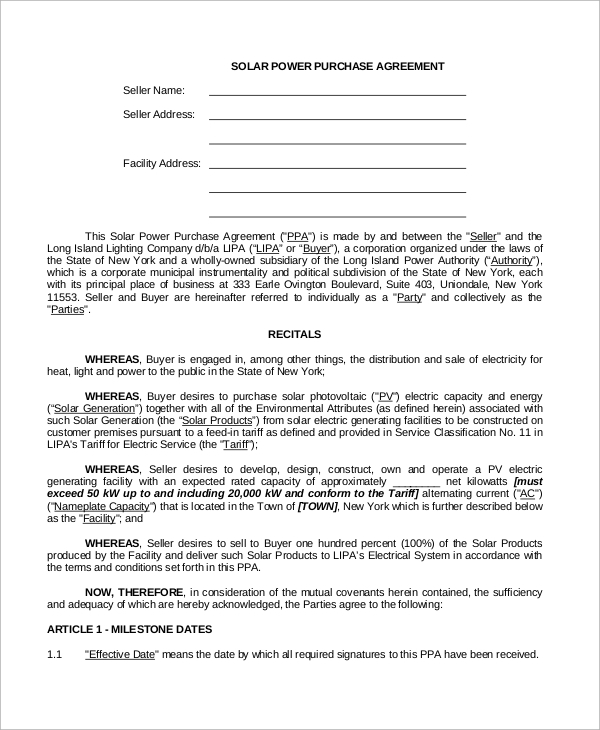 These Sample Power Purchase Agreements ensure that both the consumer and the supplier abide by the terms of the agreement. Whenever you need these templates, you can browse the website for them. You can download any of these and edit it as per your requirements. You may also need real estate purchase agreement or Lease Purchase Agreement, and the website has all these templates across various formats, ready to be customized.